Blond bomber Rory McIlroy plans to streak to victory in the UBS Hong Kong Open. The big-hitting Holywood star, 21, set tongues wagging worldwide over his new blond hairstyle. But he shrugged off criticism of his barmy barnet and vowed to have the last laugh at Fanling on Sunday. Hoping to be the “mane” man and win on the Europe circuit for the first time in 21 months, McIlroy said: “There is not enough blonde in it. But I’m going to get more put in it when I get back from Tiger’s event (in LA). 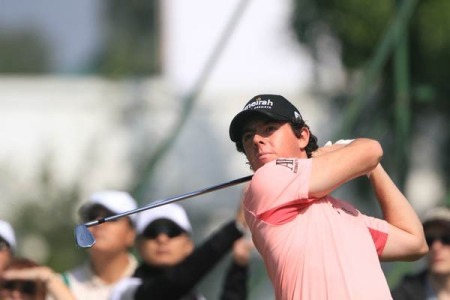 McIlroy loves Hong Kong where he first played in the Faldo Junio Series as a teenager. As a professional he’s finishing second in the event for the past two years, losing in a play-off two years ago before coming up two shots shy of Gregory Bourdy last year. And after shooting more birdies in practice than Race to Dubai hopeful Graeme McDowell, he headed off for a night at the races with an extra $100 bill in his pocket. McDowell joined McIlroy at the racing in an effort to relieve the tension of his grim battle with US PGA champ Martin Kaymer for the Race to Dubai title. With the German taking the week off, he’s determined to slash Kaymer’s €367,600 lead before next week’s megabucks Dubai World Championship decider. Kaymer scorched nearly €1 million clear of McDowell at the top of the Race to Dubai when he clinched his fourth win of the season in last month’s Dunhill Links. But after winning in Spain three weeks ago and then taking third in Singapore on Monday, McDowell is finishing like a derby winner. Before heading off for a flutter on the gee gees, McDowell said: “I am making a big push towards Dubai. This week is important and next week is huge. From here on out it is hard work and try to get the balance right between working hard and staying physically fresh and ready for next week as well. “The form is good. I set out in these five weeks to put a shine on the season. I could have easily kicked back after the Ryder Cup and put the feet up and called it a year. “But I wanted to finish strong and it will make Christmas dinner taste even better if I can push Martin all the way to the line next week. “Whether I go past him or not, to give myself an opportunity to win the order of merit considering the type of season he has had, feels good. “Setting out on this run I really had doubts whether I could get close to him. To play as well as I did at Valderrama and win there and then a third place last week. And he hasn’t had the best three weeks. And the Race to Dubai? Major winner Geoff Ogilvy is tipping Rory McIlroy to take over from Tiger Woods as world No 1. McIlroy is on a rollBut the Ulster kid’s first goal is to become king of Europe so he can hurry home and play with his new Lamborghini. McIlroy is just €52,320 behind Race to Dubai leader Lee Westwood as the top two go head to head in this week’s UBS Hong Kong Open.